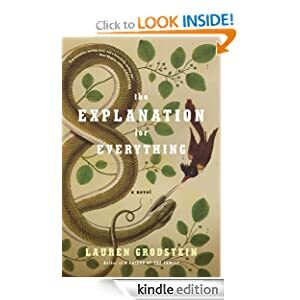 The evening I finished reading The Explanation for Everything by Lauren Grodstein happened to be the same night I saw a clip of The Daily Show’s “The War on Christmas.” In this segment liberal comedian, Jon Stewart, mocks Fox News correspondent, Megyn Kelly, who assures the “kids” watching her ten o’clock news show that Santa is white – he “just is” – and her advice to those advocating for more black Santa representations is to embrace white Santa: “just because it makes you uncomfortable doesn’t mean it has to change,” she says. The whole situation was something I’m used to seeing in the media: a right-wing Christian sounding arrogant and ignorant, and a left-wing liberal sounding arrogant and smug. The stereotypes were reinforced. On one side you have the religious: closed-minded and holier-than-thou; on the other you have the nonreligious: closed-minded and smarter-than-thou. The one place where this stereotype isn’t reinforced? Grodstein’s novel, which, in its humble way, provides a lot to think about in terms of religion and the complexities of belief. The book starts out with what seem to be two stereotypes: Andy Waite, a middle-aged biology professor who teaches a class on evolution colloquially referred to as “There Is No God,” and Melissa Potter, a mousy undergraduate and devout Christian who wants to do an independent study on Intelligent Design. Andy agrees to oversee her project with the intention of changing her mind, while Melissa is harboring the same notion. But things get complicated when Andy finds himself inexplicably falling for Melissa, and she returns his affections. At this point, it could have been so easy for Grodstein to turn her characters into mouthpieces and use them to try to convince us of her own ideas. But she doesn’t do that. Instead, all the characters get a chance to expound on their beliefs, and to doubt them. As I read, I kept wondering what Grodstein herself actually believed. Was she an atheist like Andy? A Christian like Melissa? It wasn’t until I finished the book and read the author’s note in the back that I found out, and I was somewhat surprised. In fact, I was surprised by how much I enjoyed the novel overall. I liked its snappy yet heartfelt style, and just went I thought I knew what to expect, a little twist would be thrown in to keep me flipping pages. Although I didn’t always like the characters, the story was compelling, and I found myself facing some of my own judgmental beliefs about Christianity. On the night I finished the book, I told my scientist boyfriend that we should have more discussions about spirituality.Not only did the novel explore the complexities of our beliefs and how they can be challenged, it also took a look at the complexities of human behavior. Just like all of us, the characters in The Explanation for Everything don’t always act in accordance with their beliefs, and sometimes their beliefs waver. Andy is probably the most complex character with the biggest emotional roller coaster to ride. Throughout the book he deals with the ghost of his dead wife and his refusal to find forgiveness for the drunk driver who killed her. He has a clumsy and selfish affair with an alcoholic neighbor before entering into an inappropriate relationship with Melissa. He is not an altogether likeable character, but his flaws are what make him real. And in his agony, he starts to wonder if changing his beliefs might help him find solace. Of course, the “solution” to Andy’s existential crisis is much more complicated than that, and at the end of the book no one is proved right or wrong. But perhaps everyone is a little bit more open-minded than they used to be. Andy notices the gray area he didn’t see before: something the modern media doesn’t often show us. Our televisions may be in color now, but in many ways the opinions we see are still in black and white. (And this time I’m not talking about Santa.) For a more well-rounded exploration of religion and belief, I’d turn off the tube and hit the books, starting with this one.